Historically solid timber core door blanks were manufactured with a single layer timber raft for the core with plywood faces laminated to either side of this core. 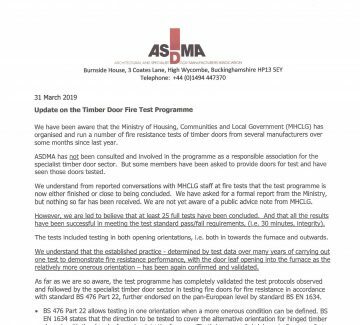 The result being that single layer door cores can often be manufactured with timber species of a different durability rating, different densities, different moisture content and as such result in instability in the single layer core with regards to performance. The Flamebreak range of door blanks has been designed with a light weight tri-laminate three layer core manufactured from a single hardwood species to provide for a quality door blank giving greater dimensional stability and performance. 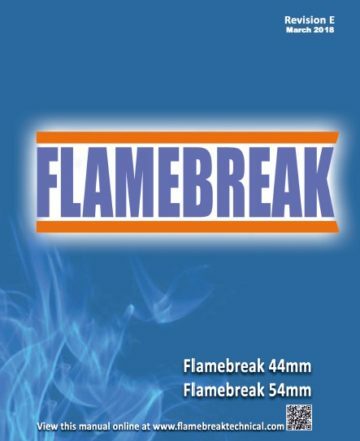 Flamebreak has developed over the years from the early days of being a simple plywood faced doorblank to now covering both 44mm and 54mm thick door blanks in a comprehensive range of panel sizes with either a high quality hardwood plywood or MDF face. The Flamebreak brand has been established for approaching twenty years and now comprises a full range of light weight solid timber core door blanks which have been manufactured and tested for performance in Fire, Acoustics, Thermal Transmittance, Mechanical and Security applications. 44mm thick internal or external door blank manufactured with a 4mm thick plywood face, constructed with a lightweight hardwood tri-laminate core with hardwood framing. 44mm thick internal door blank manufactured with a 6mm thick MDF face, constructed with a lightweight hardwood tri-laminate core with hardwood framing. 54mm thick internal or external door blank manufactured with a 6mm thick plywood face, constructed with a lightweight hardwood tri-laminate core with hardwood framing. 54mm thick internal door blank manufactured with a 6mm thick MDF face, constructed with a lightweight hardwood tri-laminate core with hardwood framing. 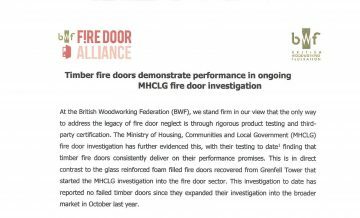 To request a permission letter to utilise the full stable of test evidence applicable to Flamebreak door blanks please submit your details in the boxes provided. By submitting your details you are consenting to our response and maintaining your records on file in accordance with GDPR regulation. If the request is the result of an audit, certification body or compliance for Third Party membership scheme please indicate the name of the company or organisation e.g. Exova BM TRADA Q Mark or BWF Certifire.